A lot of work goes into creating quality, educational content that earns your organization a high rank and drives traffic. So, why would you want to re-publish your articles on other platforms such as LinkedIn and Medium? While there are pros and cons to doing almost anything, sometimes, you need to take some risks to meet your objectives. Re-publishing content, while possibly running the risk of duplicate content, is a great way for you and your company to increase your reach and brand awareness. If you’re thinking about re-publishing your content, whether it’s on LinkedIn or Medium, I’ll walk you through the risks of doing so and some essentials do’s and don’ts to keep in mind when implementing this tactic in your inbound marketing strategy. Re-posting your content or syndicating it on other sites is great for expanding your reach and capturing a new audience, but if it’s not done correctly, you could run into some ramifications, such as a loss in traffic and being penalized by Google, hurting your rank. Due to higher site authority, there’s a good possibility that your article on LinkedIn, Medium, or other sites could outrank the original piece on your website in search results. As we know, about 92% of search inquiry clicks go to the first page, and 33% goes to the very first result, so every spot matters. Republishing on LinkedIn or Medium could result in a loss of traffic as your article gets pushed down the ranks. You will, however, have the opportunity to increase your referral traffic, which I talk more about below. The loss of traffic or having your syndicated article rank higher than your original post, might not have as big of an impact depending on your overall goal for implementing this marketing tactic. Ask yourself, what is your objective for re-publishing your content on external sites? Are you looking to expand your reach? Build brand awareness? Target a new audience? Generate leads or even revenue? If your objective is to educate and share your content with as many people as possible, losing traffic or being outranked might not matter. By re-posting your content you also run the risk of being penalized by Google. As mentioned above, the main issue with duplicate content appearing on LinkedIn and Medium is that these platforms have higher site authority than your website. If Google gives attribution to those sites, not only will that article rank higher than yours, but your website will also be flagged for having duplicate content. While there can be some downsides to publishing on Medium and LinkedIn depending on your goal, it is always a great way for your company to expand it’s reach, build brand awareness, and capture the audience of new readers. Here’s a look at what you should and shouldn’t do while reposting your content on those networks. Don’t re-post the content immediately after the original article is published. As suggested by the HubSpot Content Marketing Certification course, you should wait at least two weeks for that article to be indexed by Google. If both pieces of content are published at the same time, it can be difficult for Google to distinguish which version they should include/exclude in their index. 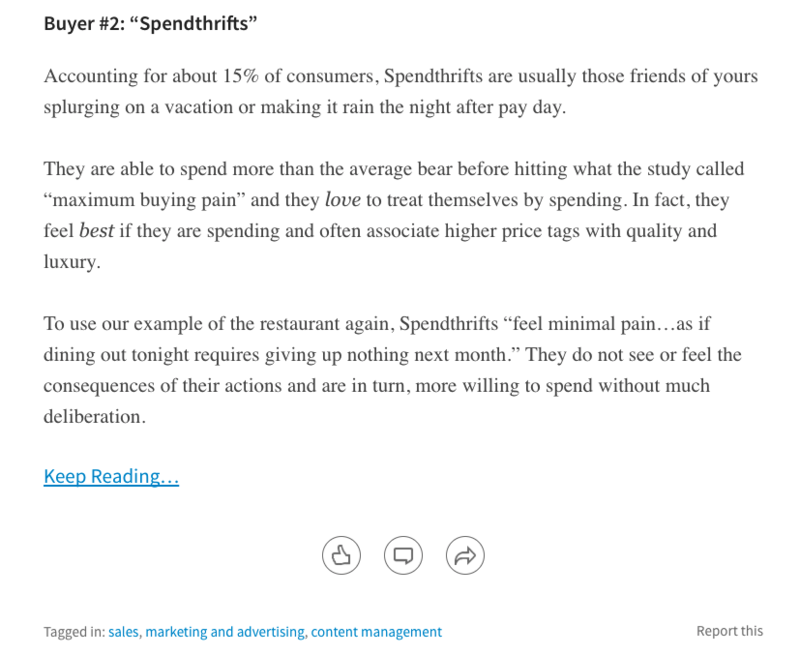 Syndicating is a great way to expand the reach of your content, however, when you’re re-posting content on LinkedIn and Medium, don’t give the readers the entire article -- especially if your goal is to drive referral traffic. To drive traffic back to your site, you’ll may want to only include the introduction as well as the next paragraph or two depending on the length of the article. By only including a small portion of the article, you’re getting your audience to continue reading the article on your blog. This is where you’ll want to include a continue reading or read more link at the end of your article that brings readers back to your website. While Medium and LinkedIn are great platforms for re-posting your content, you’ll want to think about who your audience is on both platforms (they won’t always be the same). Are you talking to a young professionals or addressing senior executives? Do they actually use this platform? Depending on the group, your tone and language should change to appeal to those individuals and make sense for the platform you’re republishing to. In some cases, you might even want to rewrite the article to effectively reach those audiences. Another thing you’ll want to think about when posting on Medium is which account should you publish from. Should it be your company profile or from the author’s Medium account? Personal Account: If the topic is personal to you or you’re giving your opinion, those are great posts for publishing under your personal account. Company Account: Should be used to publish other articles that are tactical or educating you on how to do something. If you are concerned about having the site you’re syndicating on outrank you, use a rel=canonical link -- this is a snippet of code that basically tells Google and other search engines which website should be given priority/credit for the content on the page. By using the line of code below, the site your article is republished on is essentially telling Google to give all the credit to you and to not index the article on the external website. This is something Medium automatically does when articles are imported, but this is not the case if you’re simply copy and pasting the article from your blog into Medium. Whenever you want to publish an article to Medium, use this tool. 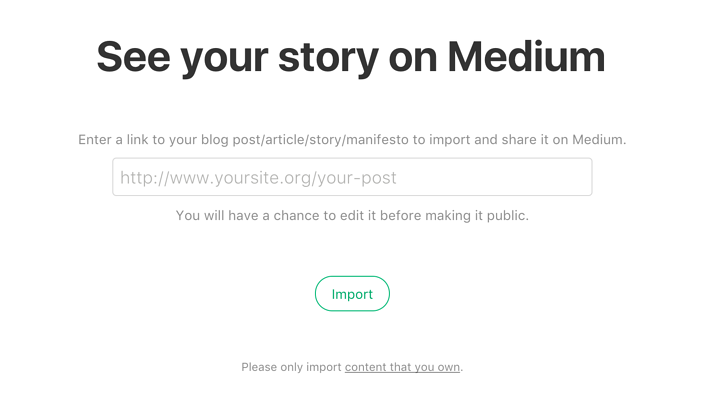 Medium created an import tool that makes it really easy for you to add your content onto their platform. All you have to do is paste the article’s link into their tool and select import. Once the article is imported, you’re able to make changes prior to publishing. For more detailed instructions, read this. By using the tool, Medium will automatically add a link at the bottom of the article identifying it was originally published on another site. When republishing content, consider making some changes to the title or even the photos used. As with any article you’re publishing, you’ll want the headline to be enticing and to pull your audience in. To a degree, this will also help you avoid duplicate content. Here are some tips to help you nail down another title. Another way that you can draw readers to your content is by including a compelling image. You’ll want to stay away from stock photos. Consider using Photoshop or Canva to create personalized images for the article and platform . If you do end up using stock photos, here are a couple royalty free image sites you might not know about. No matter where you’re publishing your article, whether it’s on your blog, on Medium or LinkedIn or even on an influencer’s site, it’s important to optimize your article for search engines and to include links to other content on your website. Even if you follow all of the best practices mentioned above, there still could be some risk to re-publishing your content. If you are worried about your site being penalized for duplicate content, you might want to rewrite the article or develop a content strategy that’s specifically for LinkedIn and Medium. While the tips above can help you expand the reach of the content you’ve already created, the best way to capture your audience’s on LinkedIn and Medium is to create content that’s unique to those platforms.